Ignatius Press (San Francisco, 2016). In this excellent, well-written and highly readable book, Russell Shaw presents the stories of 15 famous Catholics, from American Catholicism’s first bishop, John Carroll of Maryland (1735-1815), to the period, roughly, of the Second Vatican Council. The author, who has published more than 20 books on Catholicism and Catholic history, is well qualified for the task. For almost 20 years he directed media relations for the U.S. Conference of Catholic Bishops. During that time I was on the staff of the conference directing Catholic-Jewish relations and there were a number of public controversies that he and I worked on together. 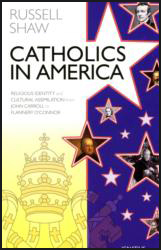 “Catholics in America” brings to life a number of key figures in American Catholic history and along the way provides a concise history of the church in this country and the controversies it faced both internally and in its relations with Protestant America and with the Holy See. Its underlying theme is how Catholics worked to be accepted in the larger society into which they had immigrated and were assimilating while preserving their faith as part of the larger, universal church. This was not an easy task. On the one hand the Irish and German, then Italian and East European Catholics, wanted and needed to preserve their own cultural traditions yet still be accepted as fully Catholic and fully American. This resulted in ethnic parishes and enclaves. Yet when these largely working-class Catholics left their homes and parishes to work or even to shop, they intermingled with the larger society. Many in that society, mainly the white Anglo-Saxon Protestants, did not want to accept the “newcomers” into their social, academic or professional lives. Clashes were all too frequent and sometimes violent. Because of the shared discrimination against them, Catholics and Jews throughout the United States came together as perhaps nowhere else on earth, creating the foundations for the dialogue between our two communities that has flourished internationally since Vatican II. Shaw might have mentioned this when dealing with the legacy of St. Elizabeth Ann Seton, since the two universities named after her have been significant in pioneering the dialogue, while the Paulist Fathers, the American congregation founded by Father Isaac Hecker has likewise exerted significant energy into Catholic-Jewish and ecumenical endeavors. Jewish support for the presidential campaigns of Al Smith and John F. Kennedy was also significant. Finally, I would note the importance of Dorothy Day, who was raised by Pope Francis during his visit to this country as an exemplar of American Catholicism at its best. I knew her, too, and helped her organize pro-civil rights and anti-Vietnam marches during my years in New York. She deserves to be acknowledged by the church for the saint that she was. This is a book for all Catholics today, to understand our pilgrim church in a land of hopeful promise.